Some of you, like ogy86, know this cheerful young women photographed with Summer Glau at Dragon*Con Atlanta 2006 very well and some of you probably follow our mystery guest on social networks and visit her fan site without knowing what she looks like. Allow me to introduce our good friend and Summer Glau enthousiast Kali, who runs the Summer Glau Daily fan site. Btw, the photos of Kali's meeting with Summer are displayed in the "About me" page at SG Daily. On Feb 5th, Summer Glau Daily turns 2 and Kali is running a contest to celebrate the anniversary; feel free to pay her a visit and leave a thank you note and/or words of encouragement. read more here. Side note: thank you Leah for submitting a mystery guest! far out i had no idea that was her. she looks completely different then i imagined. Then Leah had a good idea! Björn Rune Borg is a former World No. 1 tennis player from Sweden. Between 1974 and 1981 he won 11 Grand Slam singles titles. He won five consecutive Wimbledon singles titles and six French Open singles titles. haha is that the new contest? guess what forum members might look like? Thierry Daniel Henry is a French footballer... Arsenal's all-time leading scorer with 228 goals... won two league titles and three FA Cups with the Gunners; nominated for FIFA World Player of the Year twice, named the PFA Players' Player of the Year twice, FWA Footballer of the Year three times... similar success with the French national team, won the 1998 FIFA World Cup, UEFA Euro 2000 and 2003 FIFA Confederations Cup, France's top goal-scorer of all time... also one of the top commercially marketed footballers; he was ranked ninth in the world in 2006. 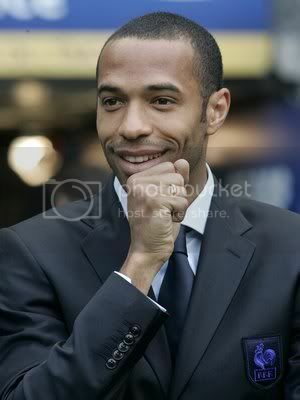 I like Thierry Henry he is cool and was a good player to watch, and I'm not even a footballhead. Time for another "Guess Who" picture. Can you guess who is hidden behind that painted face? This one is too easy. I will not post an answer too early to give more users a chance. Oh really? If I didn't know very well the fan who submitted this image, I would not have found that easily I guess. Anyway here is the answer: http://en.wikipedia.org/wiki/Psyanotic . Yes, this is Thomas Dekker! Psyanotic Is the debut album of American actor Thomas Dekker. The album is currently available in digital format and can be found in sites like CDBaby, Napster and iTunes. As he explained in an interview: "The term Cyanotic is a scientific term for when there is an inadequate supply of oxygen to the blood. I changed the spelling to Psy, as in psychology, as a metaphor for a lack of thought in today's music. I suppose the album is to be a kind of cure, hopefully, for this prevailing lack of mental and emotional stimulation." The album was recorded, mixed and mastered by Thomas himself, Some songs were uploaded to his personal MySpace page before the release of the album including: "Dare", "Lava Life" and "Aicea" as well as an album teaser, Songs that were later tweaked for the album. Thomas later explained in a Q & A session: "The album was only tweaked because music should exist in the time it is released, above all, and the album had been started so many years earlier."